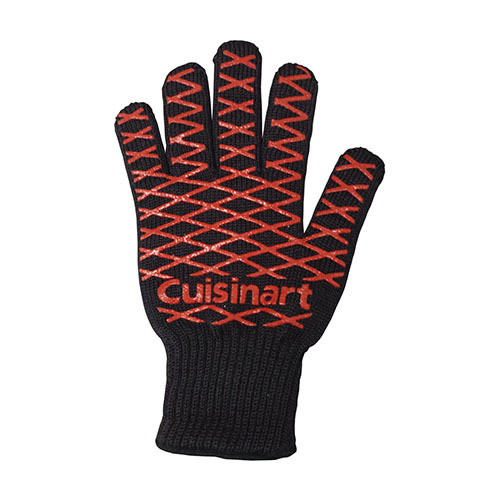 The Cuisinart CGM-111 is a grill gauntlet mitt which is made of Aramid fiber mostly known for its aerospace and military applications. This grill mitt can withstand up to 475 degrees and is perfect for removing hot platters and foods from the grill or outdoor oven. This ambidextrous glove will be the perfect fit for any hand use. The silicone overlay will provide the perfect grip for items with a handle going on and off the grill. 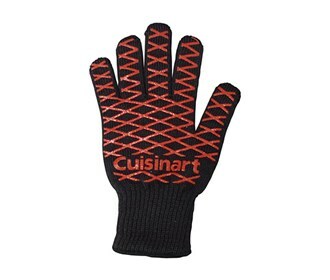 The Cuisinart Grill Gauntlet Mitt has many exciting features for users of all types. You can extend the lifetime of your Cuisinart Grill Gauntlet Mitt with the purchase of a FactoryOutletStore Factory Protection Plan. See the Cuisinart Grill Gauntlet Mitt gallery images above for more product views. The Cuisinart Grill Gauntlet Mitt is sold as a Brand New Unopened Item.